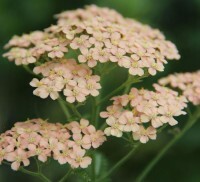 Lovely variety of Yarrow with flowers that open coral-red, fade to soft-peach, both colours seen on plant at same time, very attractive. Lachsschönheit, translates as Salmon Beauty. Height 80cm. Full sun. Good bor Butterflies & Bees.